Professional MBA Open House scheduled for Dec. 7. LEXINGTON, Ky. (Dec. 4, 2017) — The University of Kentucky's Gatton College of Business and Economics will be hosting a Professional MBA Open House event beginning 5:30 p.m. Thursday, Dec. 7, in the new $65 million Gatton College of Business and Economics building on campus. The event will be open to all UK employees and working professionals and executives in Central Kentucky interested in Gatton’s Professional MBA, Professional MBA For Leaders in Healthcare and Executive MBA programs. The event will feature the Professional MBA which is a part-time, evening program that brings together a diverse network of working professionals from various work experiences, companies and industries such as engineering, law, health care, agriculture, transportation, manufacturing, technology, banking/finance, government and the military. Offered in either a two-year or three-year plan of study, students have the opportunity to bring their daily work responsibilities into the classroom and then apply what they learn back into the workplace the following day. This program is also offered in some of the dual degree MBA options for certain candidates. 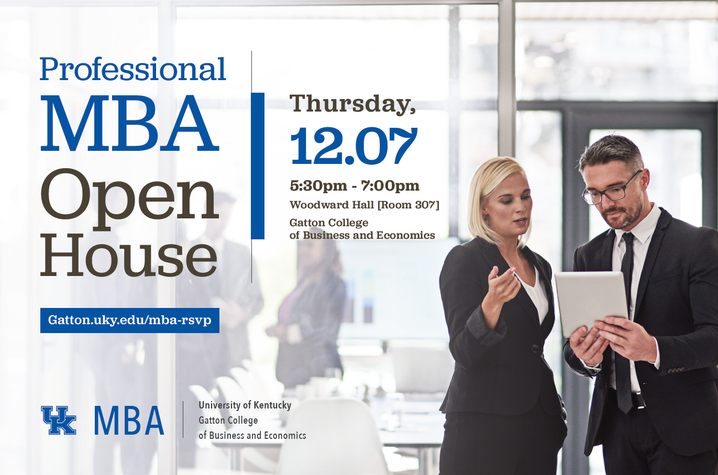 The Professional MBA Open House event will have limited spacing and registration is required online at www.gatton.uky.edu/MBA-RSVP.